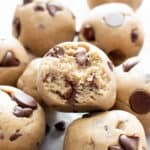 Paleo Chocolate Chip Cookie Dough Truffles (Vegan, GF) – This rich ‘n satisfying vegan cookie dough truffle recipe is perfect for gift-giving! It’s the ultimate edible paleo cookie dough dessert – easy to make and healthy! Happy Valentine’s Day!! Finally, V-Day actually falls on a day that’s not awkwardly jammed in the middle of the week–like, way too early to be celebrating at the beginning of the week. This time, it’s basically the weekend aka Thursday! (Wishful thinking here.) Woohoo! This totally means we can call off the rest of the week and lose ourselves in complete and utter chocolate bliss meaningful declarations of love, gratitude and so on and so forth. Right? 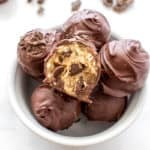 I mean, if these paleo cookie dough truffles don’t pique your interest, may I interest you in the other Chocolate Week entries for the month of February? 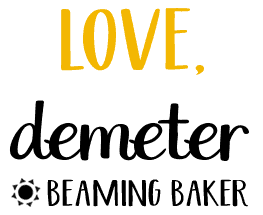 See: dark chocolate chili nut clusters, soft baked chocolate vegan donuts, & decadent raw vegan brownies. 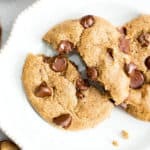 Last month, when we all desperately needed it, I shared my favorite edible paleo cookie dough bites with you. And my, how much y’all have loved it. 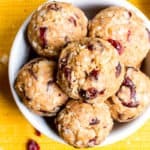 Perhaps even more than my 5 ingredient cookie dough bites from last year! Say what?!? 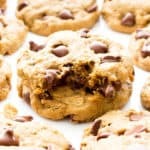 I dare say that being paleo gave this year’s edible cookie dough recipe an edge over last year’s. 😉 They’re so soft and deliciously dense. Anywho, more than anything, Erik and I love celebrating our love for chocolate, er, each other with homemade chocolate vegan treats that we can make together, swap, and feed each other. Alright, we really need to cool down the cringe factor here, guys!! 😉 TMI, much? 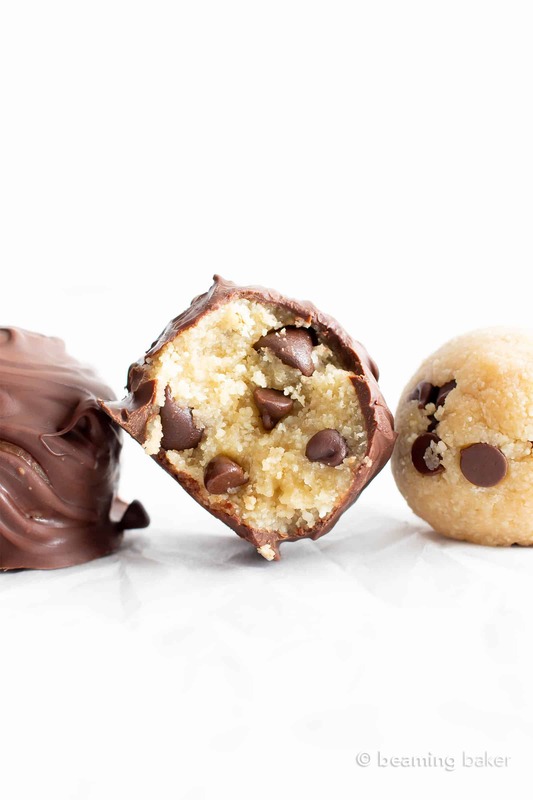 Who’s ready to learn, sharpen and lengthen (or something) their skills on the topic of edible paleo cookie dough truffles? Yay!!! I’m almost 99.9% positive all of you raised your hands. At the screen. 😉 Alright, let’s do this! 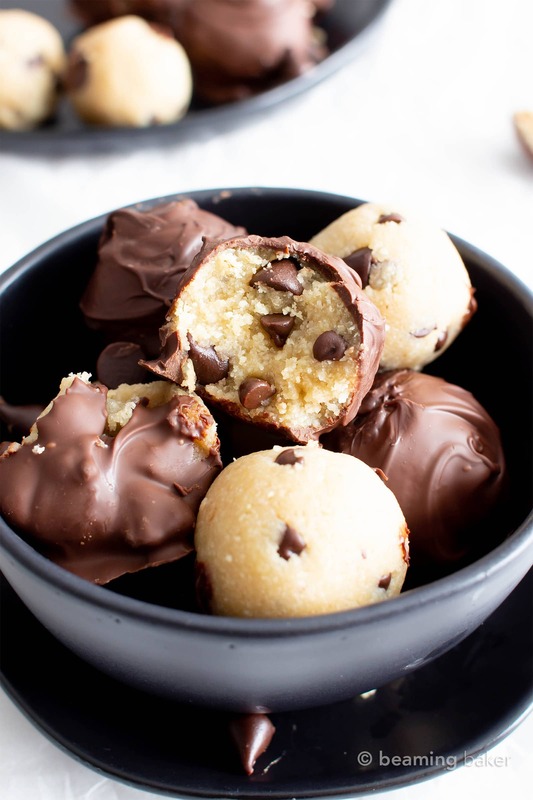 Store your paleo vegan cookie dough truffles in an airtight container at room temperature or in the fridge. You can even store them in the freezer! Allow to thaw for about 10-20 minutes before enjoying. 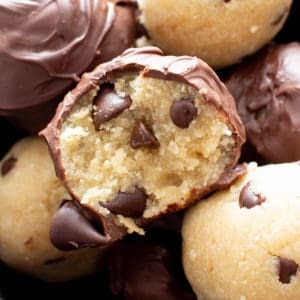 Paleo Chocolate Chip Cookie Dough Truffles (V, GF): this rich ‘n satisfying vegan cookie dough truffle recipe is perfect for gift-giving! It’s the ultimate edible paleo cookie dough dessert – easy to make and healthy! Refined Sugar-free, Dairy-Free. 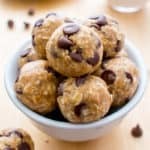 Make Paleo Cookie Dough Bites. Set aside. Melt the chocolate: Use the double boiler method or do the following. Add chocolate and coconut oil to a microwave-safe bowl. Heat for 20 seconds, remove and stir. Repeat until chocolate is just softened. Stir in between each heating increment, until smooth. 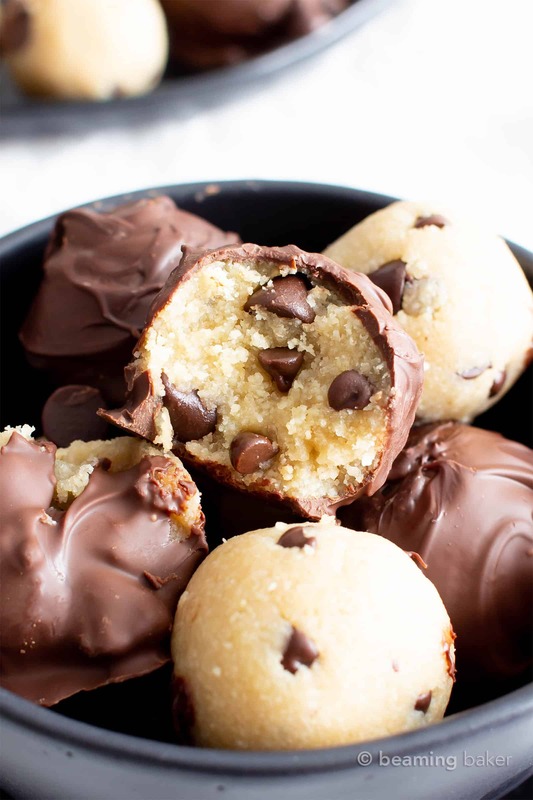 Dip the cookie dough balls: Roll cookie dough balls in chocolate and drop onto prepared baking sheet. I like to use one spoon and two forks for this step (or you could use a candy dipper). Use the spoon to roll the ball, and the two forks to pick up the truffle and roll off excess chocolate. Allow to set at room temperature, until firm. Or, place baking sheet into the freezer for 15-20 minutes. Remove from freezer. Enjoy! Storing instructions below. 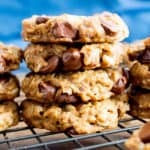 You’ll also love my Healthy Gluten Free Cookie Dough Bars and my Vegan Chocolate Chip Cookies! - Store for in an airtight container at room temperature or in the refrigerator for 1-2 weeks. Cookie Scoop – an absolute baker’s essential. Great for uniform scooping and greater control over ball size and shape. Teehee. Coconut Flour – another vegan & paleo baking essential. All you need is one bag to last you all year, practically. A little goes a long way! 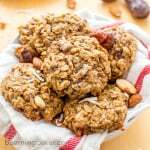 Previous Post: « Dark Chocolate Chili Nut Clusters Recipe – Healthy, Homemade & Vegan! Happy Valentines Day! 🙂 Love love your recipe! And also what I love is the fact that these can be stored in the freezer! Ooooo I can see me snacking on WAY too many of these! They look so gorgeous and delicious!! LOL oh I know exactly what you mean Chris! 😄 Hope you enjoy them! OMG these look fabulous. I know that my kids would love these especially dipped in chocolate. What a great idea for Valentine’s Day! These are such a cute looking snack, and sound tasty too. 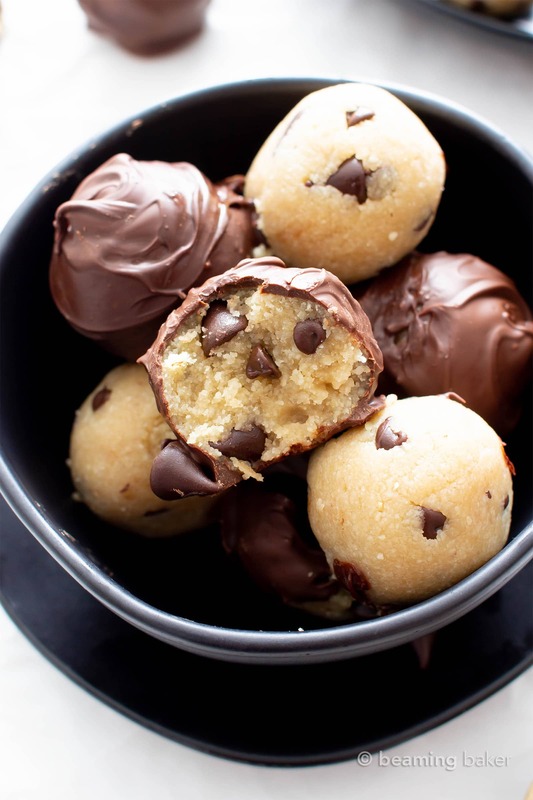 You had me at cookie dough! These are amazing and I love that they’re vegan. Haha yaass! 😊 Hope you enjoy them Eden! I was just looking for something like this! Looks delish! This is the perfect snack for my kid! He will love it for sure! 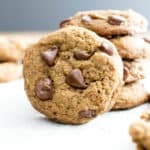 OOOMMMGGG, these are the best chocolate chip cookie, I have made. Even my picky eater loved them. Thank you, thank you, thank you!!! I am going to make these for my mom when she visits- THANK YOU! Yay!! I hope she has a lovely visit. 🙂 Enjoy!! These are so good!! Perfect snack for .my kids! Mmm! What a tasty, indulgent treat! Love the idea of gift-giving (if I could resist them)! Hope you enjoy them Erin! Demeter these look AMAZING! 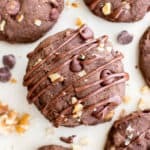 What’s your go to paleo chocolate brand? Thanks Ashlyn! My favorite is HU chocolate bars. They’re AMAZING! !